For an only child, adjusting to a new baby can be difficult, especially when that child is just a toddler. Since my second baby has been born, I’ve been asked a lot about how she is doing. And this is usually followed by an inquiry about how my oldest is adjusting to no longer being the baby. They assume that she’s reacting badly and feeling jealous or confused. But the reality is that she adjusted quite well! My eldest loves babies, one of her first words was “baby” and she still chants it over and over. She has baby dolls that she loves to carry around and take care of. Still, I did worry nearly every singe day of my pregnancy about how she would react to Mommy and Daddy bringing home a new baby. After being an only child and the center of our universe, it would have been no surprise had she reacted by acting out for attention or withdrawing when we brought home the new baby. Thankfully, I was proactive even prior to the baby’s arrival to talk to her nearly every day about the baby coming, still I knew that wouldn’t be enough. My daughter was very happy to visit me in the hospital when the baby arrived and all smiles when she was able to hold the baby. This lasted for all of five minutes when she started to realize that she was no longer the center of attention and proceeded to ignore everything to do with the baby. I began to worry at this point, but know that bringing the baby home would be the true test. Once home, my daughter was clearly not happy with the new situation. She was visibly but quietly upset. Granted, she also hadn’t had a nap and it was mid-afternoon and it turned out that was a big part of her reaction. After her nap, we let her hold the baby and give her kisses. When I went to swaddle the baby for her nap on the changing table, my daughter was right there happily and helpfully handing me some wipes. My heart nearly burst with love when I saw how eager she was to accept her new baby sister. Since then, she often talked about her baby sister and yelled at me if I didn’t immediately get up when the baby started crying. Most of this, I can only credit it to her sweet disposition. She is probably the happiest little girl I’ve ever met, and that isn’t just the mommy talking! 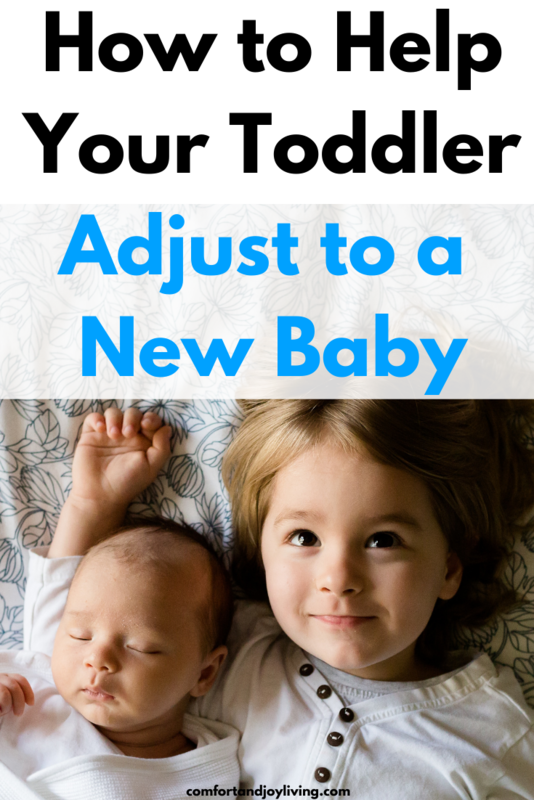 For those dealing with a harder adjustment period, there are things that you can do to help your toddler adjust to a new baby. Here are some helpful tips for parents bring home their second—or third!—newborn baby girl or boy. When your toddler comes to see you in the hospital, make it more about seeing you and not so much about meeting the baby. They want to see you, not the baby. Get them off to a good start by respecting that. Have your toddler come to the hospital when it’s time to bring your baby home. That way, it will feel more like they’re involved in bringing the baby home rather than feeling intruded on. 3. Make time for your toddler. That may seem obvious, but it’s so important. Set aside some time just for your toddler every day. Take a few minutes to read, play or just talk and cuddle. 4. Stick with Your child’s routine. Life with a baby can get pretty hectic to say the least, so it can help if you can try and stick to you toddler’s usual routine. This can be very reassuring to your toddler that they’re not being replaced and are still very important to you. 5. Let them help you. Let your toddler help you get things for the baby i.e., diapers, wipes, bottle, etc, and make sure to thank them for it. 6. Remember that your toddler is still a baby. Don’t set your expectations high and try not to get frustrated if your toddler acts out. It isn’t fair to your child for you to expect more than what they can handle developmentally. The may react by acting out or by being needy. This is completely normal, especially if your toddler was an only child and is used to being your be-all and end-all. 7. Buy them a special doll. If your kids are still quite young, giving them a special doll to play “mommy” or “daddy” can help your child feel a sense of responsibility, instead of jealousy. Try to purchase this doll a while before the baby comes so that your child can develop a sense of connection with the baby (doll). Teach your child to feed and swaddle the baby. Now is a good time to teach that newborn babies have to be handled with care. How did your other children react when you had a new baby? Do you have any tips to help your toddler adjust? Your email address will not be replaced.